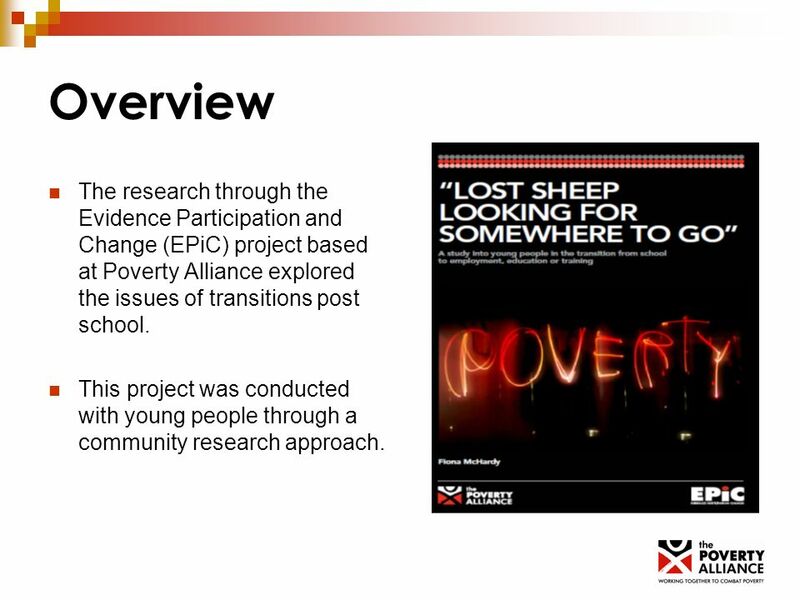 2 Overview The research through the Evidence Participation and Change (EPiC) project based at Poverty Alliance explored the issues of transitions post school. This project was conducted with young people through a community research approach. 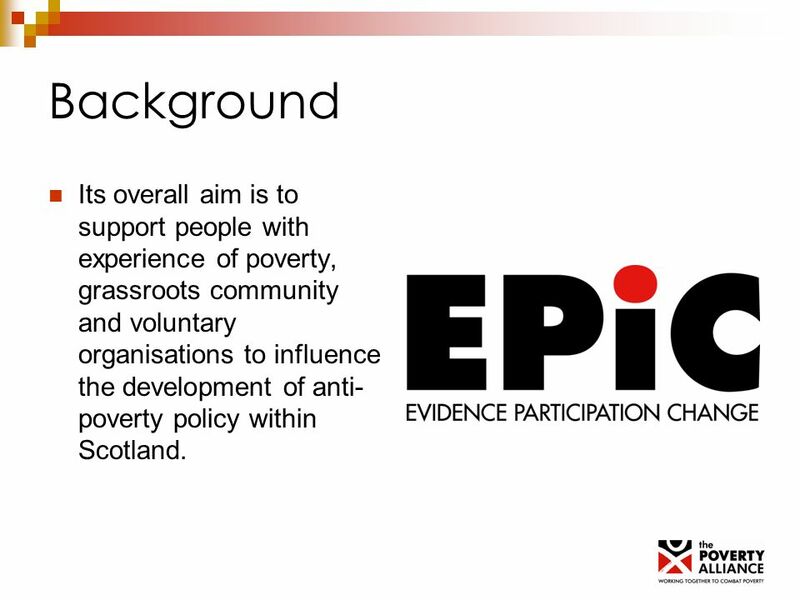 3 Background Its overall aim is to support people with experience of poverty, grassroots community and voluntary organisations to influence the development of anti- poverty policy within Scotland. 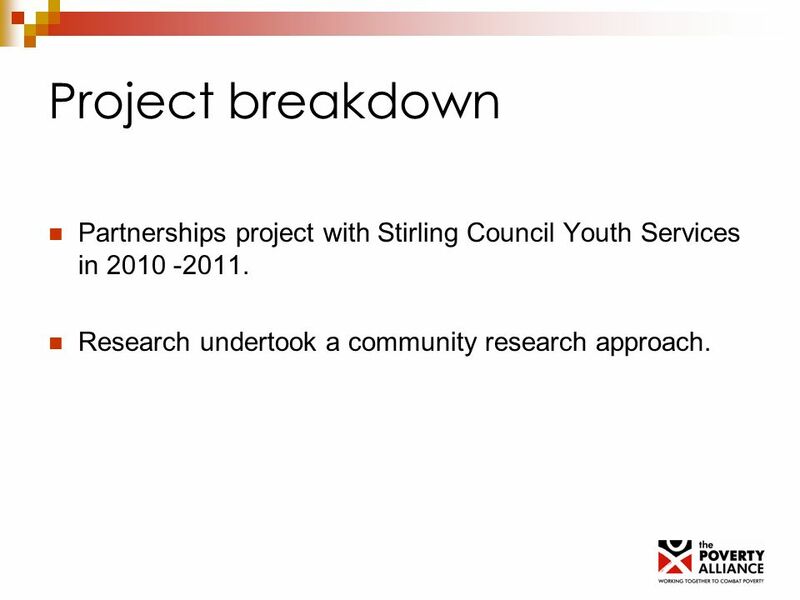 4 Project breakdown Partnerships project with Stirling Council Youth Services in 2010 -2011. 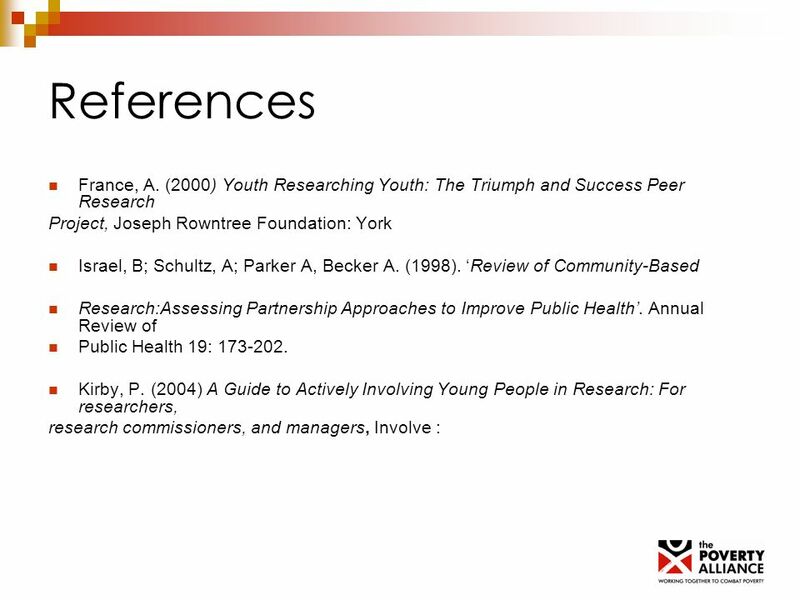 Research undertook a community research approach. 5 Research objectives The research objectives were to: Provide an understanding of young peoples views and experiences on opportunities available to them locally within regeneration areas. Contribute to understanding perceptions and experiences of the service provision available within regeneration areas. Highlight best practice in service delivery and provide policy recommendations. 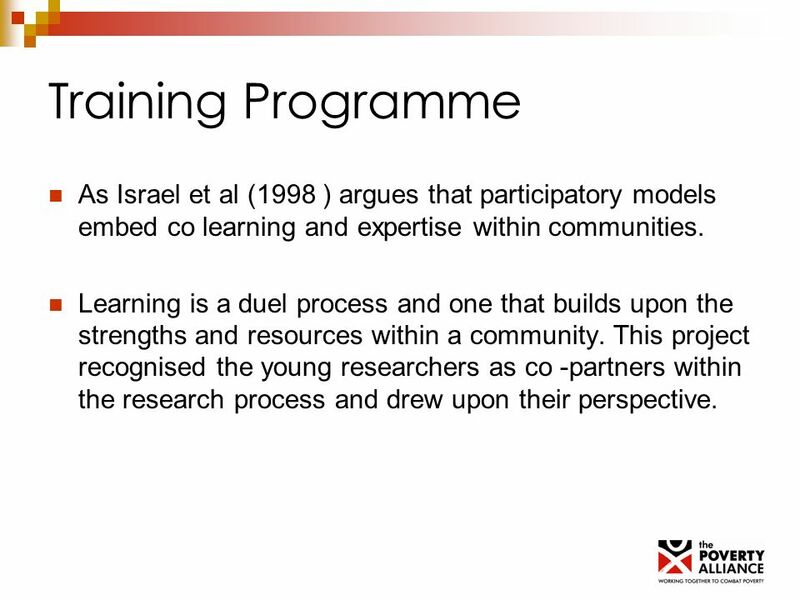 6 Training Programme As Israel et al (1998 ) argues that participatory models embed co learning and expertise within communities. Learning is a duel process and one that builds upon the strengths and resources within a community. This project recognised the young researchers as co -partners within the research process and drew upon their perspective. 7 Training Programme Bennett and Roberts (2004 p 13)argue that although trust is often seen as a by product of a participatory research projects, it crucial to the effectiveness of participatory processes. 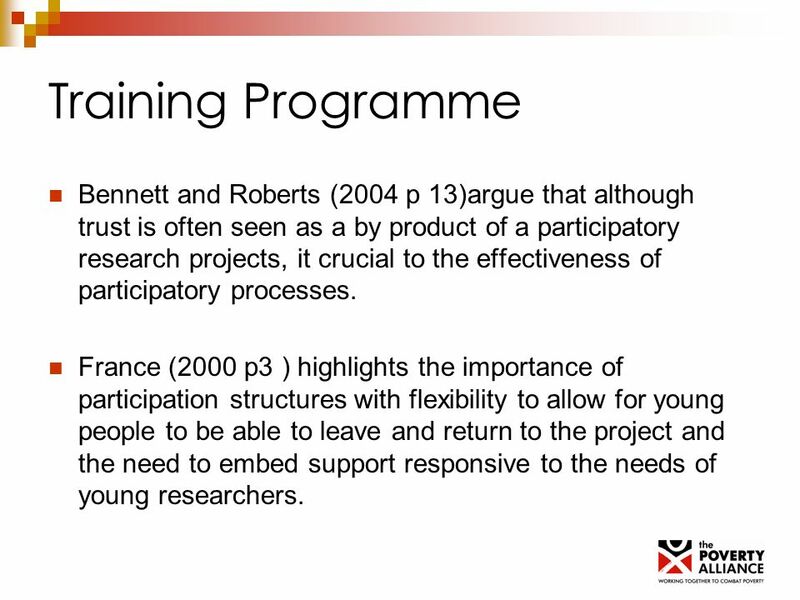 France (2000 p3 ) highlights the importance of participation structures with flexibility to allow for young people to be able to leave and return to the project and the need to embed support responsive to the needs of young researchers. 8 Research Approach Peer to peer interviews. Community surveying. Stakeholder interviews. 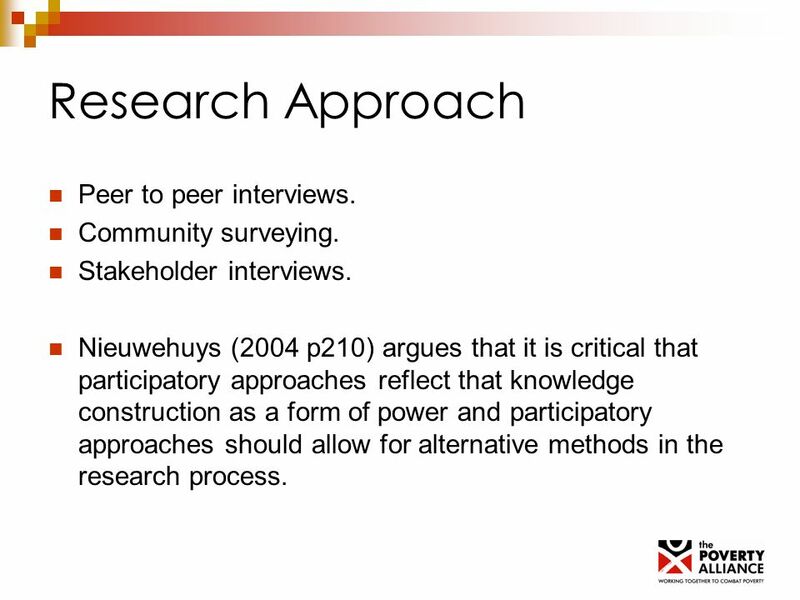 Nieuwehuys (2004 p210) argues that it is critical that participatory approaches reflect that knowledge construction as a form of power and participatory approaches should allow for alternative methods in the research process. 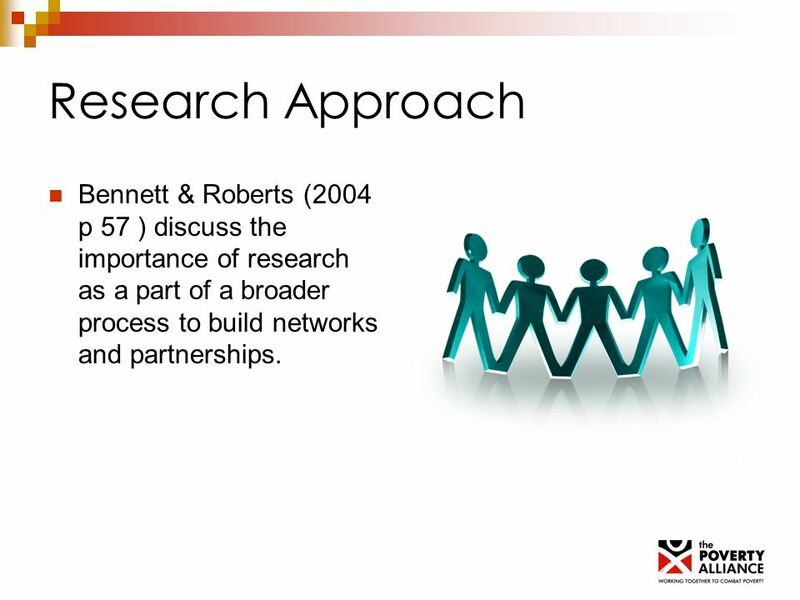 10 Research Approach Bennett & Roberts (2004 p 57 ) discuss the importance of research as a part of a broader process to build networks and partnerships. 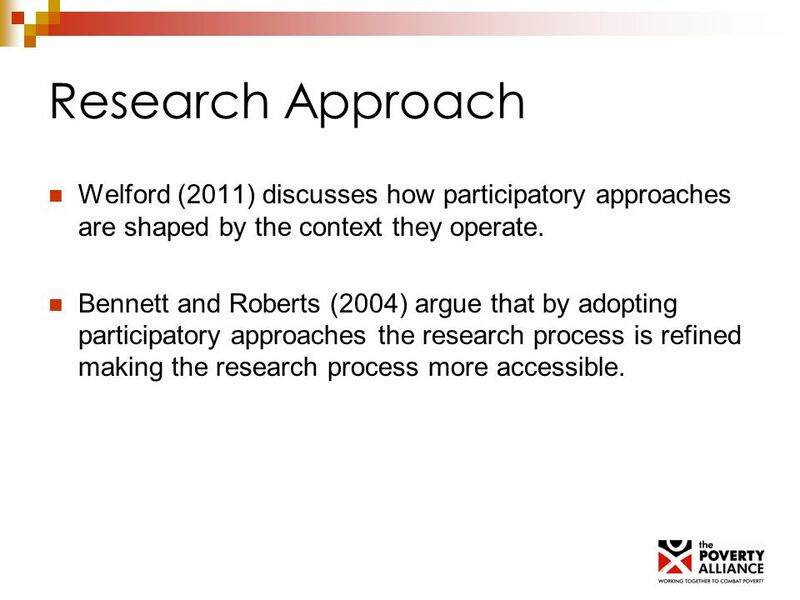 11 Research Approach Welford (2011) discusses how participatory approaches are shaped by the context they operate. 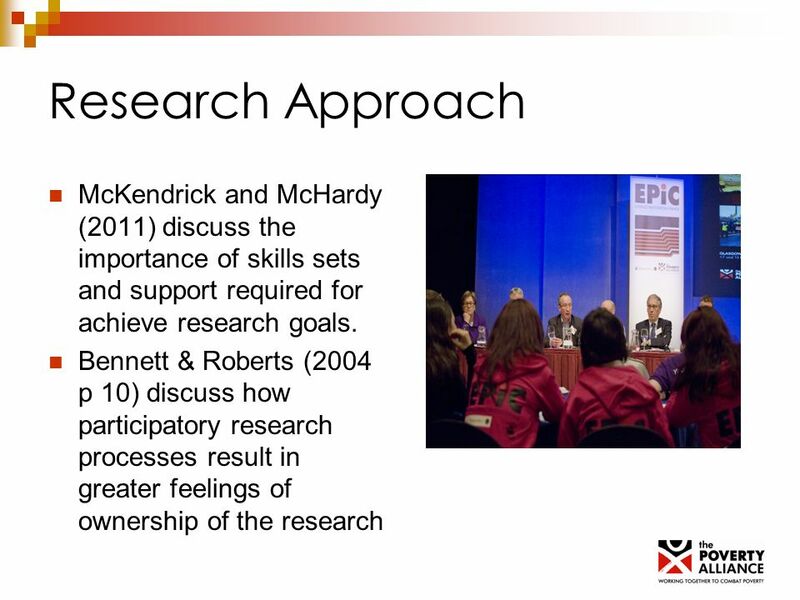 Bennett and Roberts (2004) argue that by adopting participatory approaches the research process is refined making the research process more accessible. 12 Key findings Accessing support that was accessible and tailored to their needs was seen as vital to an effective transition. Barriers that affected opportunities included financial ones such as low pay and transports costs. Experiences of services accessed for support showed the importance of services being youth friendly particularly for more disengaged young people. 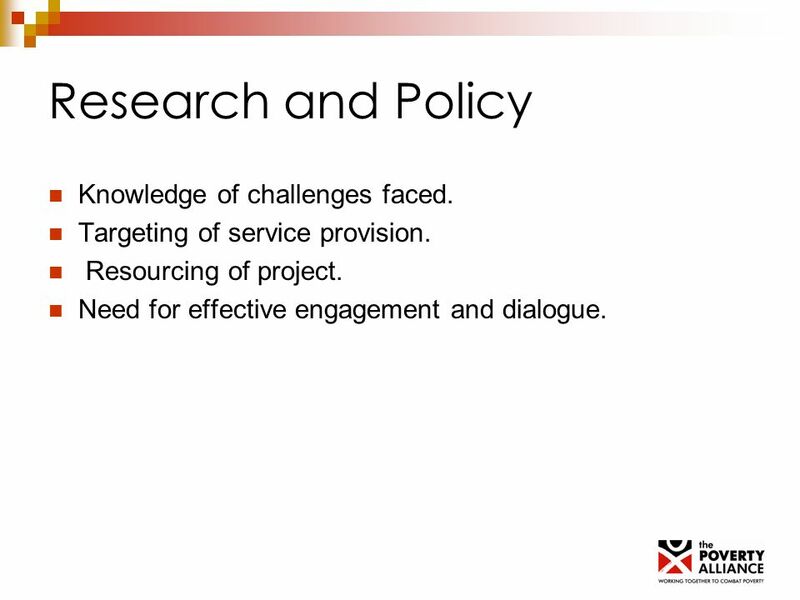 13 Research and Policy Knowledge of challenges faced. Targeting of service provision. Resourcing of project. Need for effective engagement and dialogue. 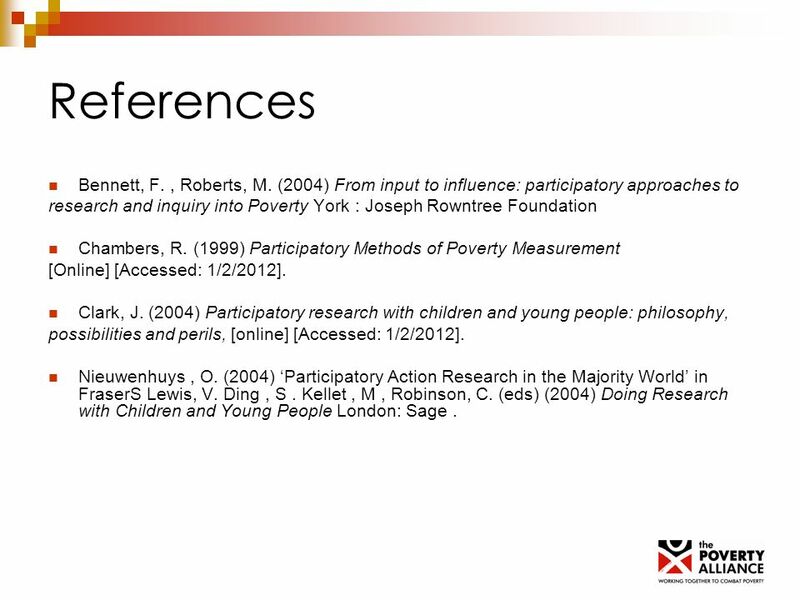 14 References Bennett, F., Roberts, M. (2004) From input to influence: participatory approaches to research and inquiry into Poverty York : Joseph Rowntree Foundation Chambers, R. (1999) Participatory Methods of Poverty Measurement [Online] [Accessed: 1/2/2012]. Clark, J. (2004) Participatory research with children and young people: philosophy, possibilities and perils, [online] [Accessed: 1/2/2012]. Nieuwenhuys, O. (2004) Participatory Action Research in the Majority World in FraserS Lewis, V. Ding, S. Kellet, M, Robinson, C. (eds) (2004) Doing Research with Children and Young People London: Sage. 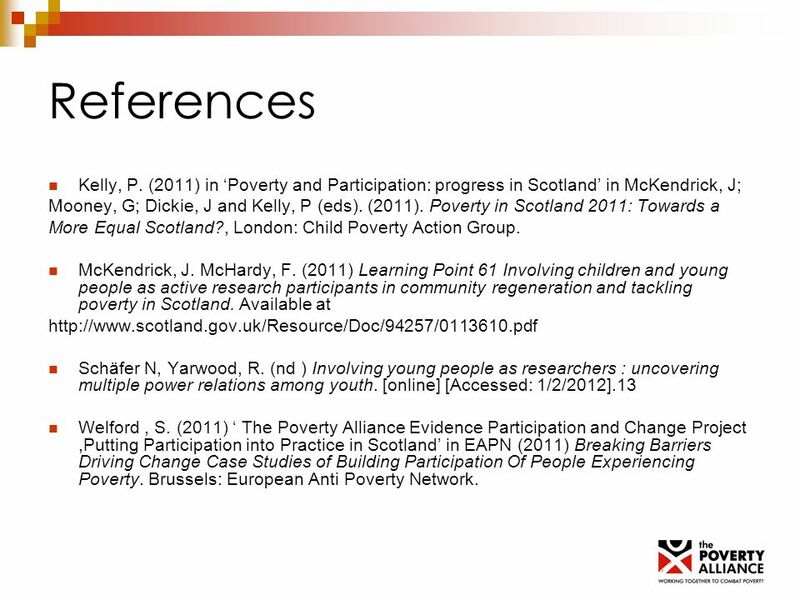 16 References Kelly, P. (2011) in Poverty and Participation: progress in Scotland in McKendrick, J; Mooney, G; Dickie, J and Kelly, P (eds). (2011). 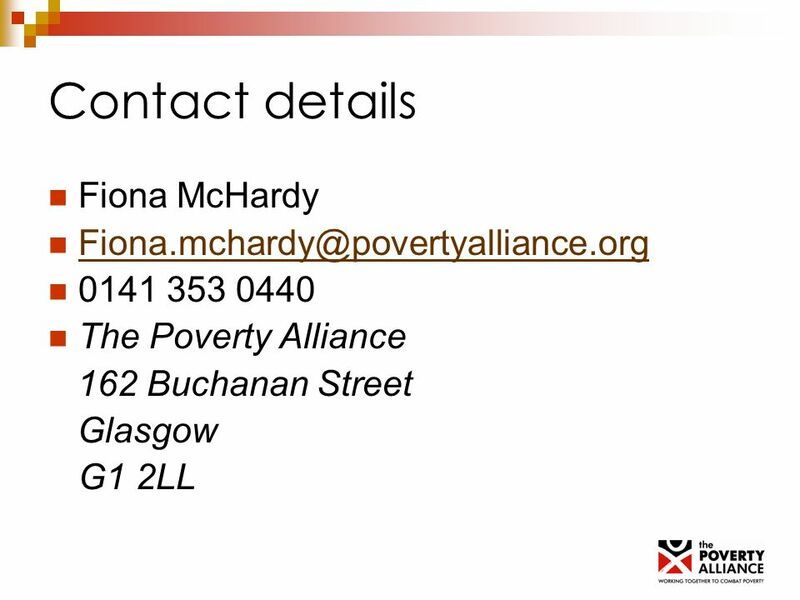 Poverty in Scotland 2011: Towards a More Equal Scotland?, London: Child Poverty Action Group. McKendrick, J. McHardy, F. (2011) Learning Point 61 Involving children and young people as active research participants in community regeneration and tackling poverty in Scotland. Available at http://www.scotland.gov.uk/Resource/Doc/94257/0113610.pdf Schäfer N, Yarwood, R. (nd ) Involving young people as researchers : uncovering multiple power relations among youth. [online] [Accessed: 1/2/2012].13 Welford, S. (2011) The Poverty Alliance Evidence Participation and Change Project,Putting Participation into Practice in Scotland in EAPN (2011) Breaking Barriers Driving Change Case Studies of Building Participation Of People Experiencing Poverty. Brussels: European Anti Poverty Network. 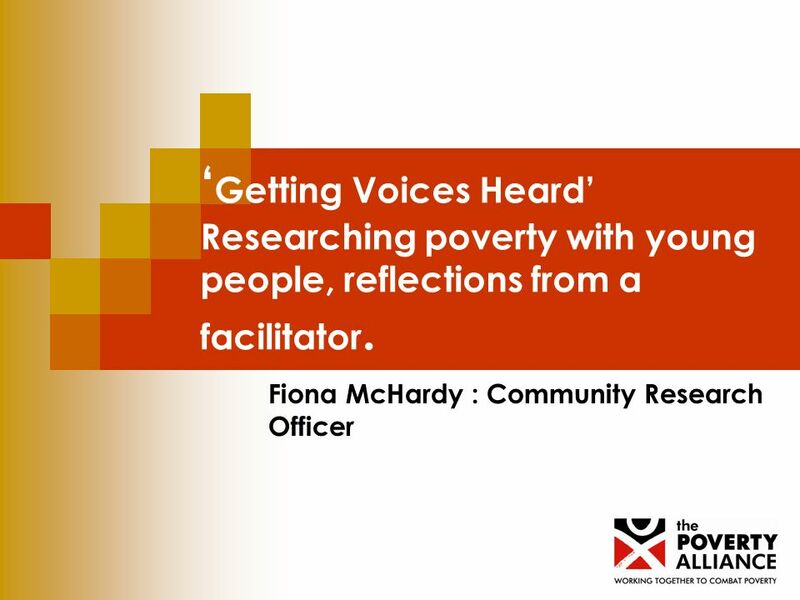 Download ppt "Getting Voices Heard Researching poverty with young people, reflections from a facilitator. Fiona McHardy : Community Research Officer." Apprenticeship target for London authorities (2000 more by 2012) World class services for a world class city Tackling Inequality. Centre for Public Scrutiny update London Scrutiny Network 6 July 2011 Jessica Crowe Executive Director, CfPS. Principles of Assessment and Feedback for Learning CHEP Strategic Work-stream Assessment and Feedback for Learning Dr Alan Masson. SW Region – Involving Learners Enhancement of Learning Support Involving learners in shaping their own support. Keep Well Practitioners’ Network Friday 23 rd November 2007 Keep Well Programme and Learning and Development Support Vibha Pankaj Learning and Development. USE OF REGIONAL NETWORKS FOR POLICY INFLUENCE: THE HIS KNOWLEDGE HUB EXPERIENCE Audrey Aumua and Maxine Whittaker Health Information Systems Knowledge.